I had a request a couple of weeks ago for a hermit thrush, and here he is. He is very similar to the wood thrush; possibly his tail is a little redder. 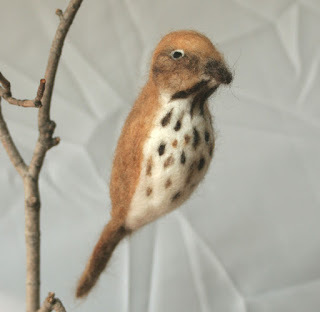 A customer who bought a wood thrush earlier in the summer sent me the link below. It is a clip from NPR about the voices of songbirds, and the thrushes are highlighted. Listen if you have the time, it's absolutely amazing.